Small freshwater mussel up to 1.5 in. Zebra is striped with zigzagged yellowish striped patterns, and flat side that can stand up on edge. Quagga is usually pale and may have colored bands or bars, sometimes with a few stripes – no flat edge to stand on. Found in freshwater lakes, ponds and slow-moving or sluggish streams/rivers. Attaches to hard surfaces such as rocks, docks, cement, wood, debris, and vegetation. Quaggas can bury into soft sediments. There are 4 waterbodies infested with zebra mussels in Nebraska. Lake Yankton (2017), the Missouri River-the entire length of the river in Nebraska (2016), Lewis and Clark Lake near Yankton, SD (2015), Offutt Air Force Base Lake in Bellevue, NE (2014). A zebra mussel eradication effort occured at Glenn Cunningham lake in Omaha, NE in late 2018 to freeze and kill a newly established zebra mussel colony after adults were confirmed in July 2018. The waterbody will be renovated and allowed to naturally refill in 2019. Regular monitoring for zebra mussels will occur. There are 2 suspect waterbodies (which means a single water sample has been found to contain zebra mussel larvae). These waterbodies include Lake Zorinsky in Omaha, NE (2016) and Carter Lake in Omaha, NE (2017). Glenn Cunningham Lake in Omaha, NE has a water sample collected in May 2018 come back positive with zebra mussel larve (veligers) in July 2018. Adult zebra mussels were found in July 2018 on samplers placed in the lake. The waterbody is not positive for zebra mussels and watercrafts and fishing gear should be cleaned, drained and dried prior to use at another waterbody. Glenn Cunningham lake was drained in the fall of 2018 to freeze and kill the zebra mussels in the waterbody. It will be left to naturally refill in 2019. Offutt Air Force Base lake was treated with Copper Sulfate to kill zebra mussels in 2008 and 2009. The zebra mussels returned and a large infestation was found in early 2014. Motorboats are not allowed on the lake but non-motorized watercrafts areallowed and boats can be rented at the boat house at the lake. Download more information here: Offutt Lake Information. 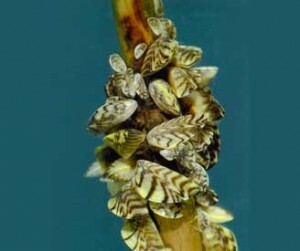 Zebra mussel larvae (veligers) were found at Lake Zorinsky in Omaha, NE in May 2016 after a fisherman reported having a zebra mussel on a fishing line. Only one water sample has come back since that time with veligers so the waterbody remains suspect for zebra mussel. If an adult is found or additional water sample has veligers it will be a positive watebody. Signs are posted at the lake alerted the public of their presence. The lake had been drawn down 17 feet to freeze out a zebra mussel population in the winter of 2010/2011. 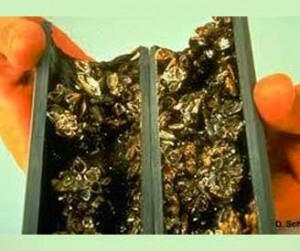 Annual sampling did not detect adult or larval zebra mussels until 2016 indicating the effort had reduced the population significantly. Gavin’s Point Dam & the Missouri River: A single adult mussel was found in November 2014 on a dock and Midway Marina in South Dakota. 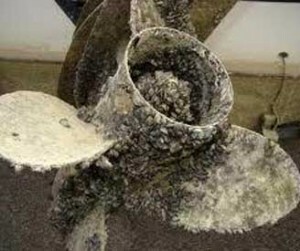 Lewis and Clark Lake, near Yankton, NE was found to have a zebra mussel infestation in August 2015 after mussels were found on the underside of floating boat lifts and moored watercrafts. The infestation was found to occur downstream from the Gavin’s Point dam in the entire length of the Missouri River on the Nebraska boarder. Any one that launches their watercraft in the Missouri River along the Nebraska boarder should Clean, Drain and Dry their watercraft for at least 5 days between use to reduce the likelihood of transporting zebra mussels. 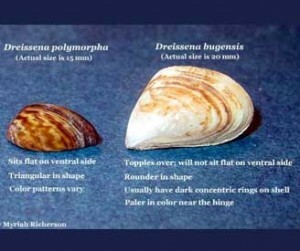 Several of Nebraska’s surrounding states have zebra and quagga mussels which threaten our waterbodies. A single zebra mussel was found on a dock at a marina in Lewis and Clark lake (on the South Dakota side) in September 2014. 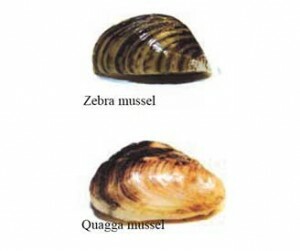 Quagga mussel larvae were found in the summer of 2014 in Angostura Reservoir in South Dakota (90 miles north of Box Butte Reservoir in western Nebraska). Kansas has 32 waterbodies with zebra mussels. Summer boater surveys and voluntary inspection are conducted each summer in Nebraka. Results are used to better aquatic invasive species prevevntion efforts. Introduced into the U.S. via ballast water in commercial shipping vessels. 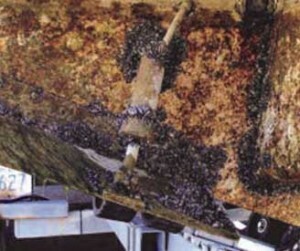 Larval stage and adults can spread between waters when transported in bait buckets, live wells, bilge water or attached to hull/motors/trailers and other equipment. Adult mussels can survive ~3 weeks out of water with the right conditions. 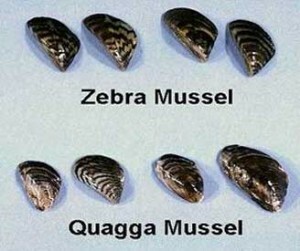 Zebra and quagga mussel larvae and adults can survive out of water for up to 30 days making them easily transmitted on boats. Clean, Drain and Dry boats before launching in another waterbody. Forms dense colonies and filters large quantities of plankton from water, decreasing the food supply for native species. Increases water clarity causing increases in unwanted vegetation. Pollute swimming areas with sharp shells. Clog water intake pipes for power and treatment facilities, irrigation pipes, etc.